It is almost 5 feet long and about 2 feet wide...yep it's HUGE! I was thinking a painted black frame or maybe a rough cedar frame? I am also going to sand it a little to give it an aged look and put a light stain/sealer over the top. This crazy sign started a business hobby that is still going strong today in 2014! Thanks to all of you who have pinned it, word has gotten around. We've seen it duplicated everywhere! We'd like to think we had a hand in helping to start the pallet wood craze. We sell lots of different style pallet signs now, and we'd love for you to visit our Etsy Shop to see how our style has evolved over the last several years. 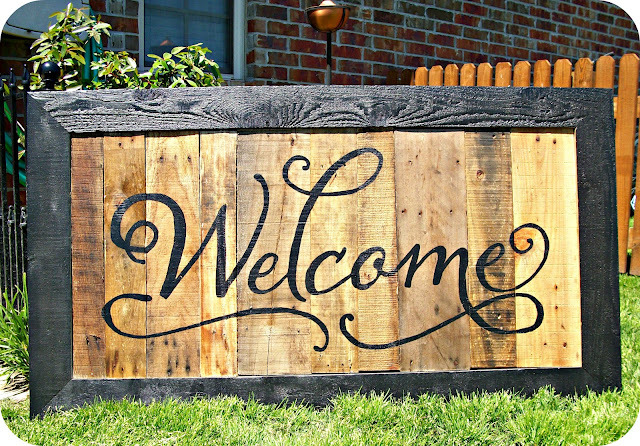 If you are interested in the *ORIGINAL* Welcome Friends & Family reclaimed wood sign, you can find it HERE. If you don't already then we would love to have you join us over at FACEBOOK. Plus, our FB fans see the newest designs first & get all the best discounts! We truly appreciate all the interest in this sign. 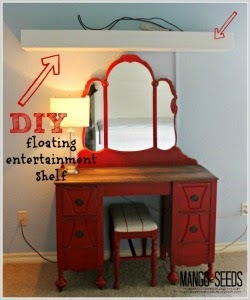 If you want to make your own, for your own home then we'd love to see a picture! You can send it to...threemangoseeds@yahoo (dot) com. However, if you own a sign business or an Etsy shop, please do not copy ours exactly. Be creative -- change up the design (font) to make it your own. Thank you. I also love your breakfast nook!!! Looks great, that is huge!!! I can't wait to see what it looks like when you get it all put up! Make sure to link that back up when you do!!! Then we can get a really feel for how big it is and how much of a statment it makes!! 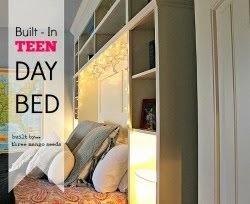 Thanks so much for linking up to DotDotDot, it made my day!!!! Thanks Tasha :) I will if this snow ever decides to scoot on out of Oklahoma!!! I think we've broken a historical record for monthly snowfall. Ugh! More is on the way tonight! 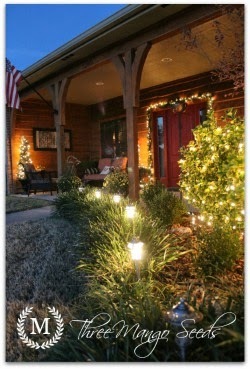 i love the your house! and that sign is cool, thanks for linking this too. That is a really cool sign. Should bring the company in from quite a distance away being that size. Very cool sign. How did you paint the letters? What's your secret for such precise painting? Come link up sometime at I Made It! Monday at Ninth Street Notions. i featured you at my party this week, grab a button from my button page. thanks for linking last week. here's the link to this weeks party. That's great, what a good idea. Hmmm, I'll have to keep my eye out for old wood and try my hand at one. Love it. I love that you saved the wood! Who in their right mind would burn such a treasure. Great job the sign looks amazing! Another great sign. Did you use the transfer method again? Oh I love your sign. Thanks for sharing. Absolutely! Please share pics if you make one!!! I love getting comments, they make my day and I read each one! So, thank you very much for taking the time to leave one! Get it all delivered right to your inbox! SUBSCRIBE below. Check out these blogs too!